The sequel to The Childhood of Jesus, continuing the journey of Davíd, Simón, and Inés--an unconventional family unit, still on the run through a nameless Spanish-speaking country, now working as farm laborers. The Jesus novels (which––spoiler alert!––have nothing to do with anyone named Jesus, biblical big shot or otherwise) are relentlessly dialogic, in the literal sense that they proceed mainly in the form of Socratic exchanges about all kinds of philosophical and ethical questions: the true nature of numbers, the conflict between reason and passion ... It certainly wouldn’t be true to say that these books are plotless, as such, because an awful lot of plot-type stuff undeniably happens in them: There are thwarted loves, workplace accidents, unofficial adoptions, clashes with government authorities, and even an honest-to-goodness murder trial. But Coetzee is transparently unconcerned with these events as anything other than occasions for discussion between his characters––characters who are, for the most part, realized only through the presentation of their speech...Such discourse is pretty dry material, even by this author’s formidable standards of dryness ... The book’s structuring opposition between reason and passion is never resolved into any kind of satisfying synthesis but plays itself out as an ongoing exchange of points and counterpoints. Coetzee [creates] a kind of fusion genre blending the energy of philosophical dialogue, the warmth and unprogrammed humor of father-son repartee, the emotional potency of a family romance and finally the uncanny suggestion of allegory (womb as ship, birth as disembarkation). The result is rich, dense, often amusing and, above all, full of inner tension and suspense ... 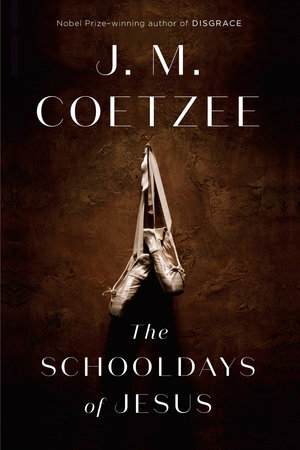 The Schooldays of Jesus may stand as a riposte to the common charge that Coetzee’s approach to fiction is cerebral and his prose dry, since Dmitri is the passionless Simón’s antithesis: a supremely flamboyant vocal performer and, despite his Russian name, a classically melodramatic Latin lover. The Coetzeean landscape is eerily stripped down, often physically rudimentary, like a vista by De Chirico: a featureless arena in which colossal philosophical questions cast long shadows. In The Schooldays of Jesus, however, the scenery is so flimsily assembled that it could come straight from Ikea ... In spite of its declared suspicion of Platonic idealism, the spirit of Plato, rather than the anarchic Jesus with his boundary-pushing parables, hovers over this book. Plato was famously dismissive of the seductive properties of mimetic literature, which urge us to make an imaginative identification with a fictional world. He would have agreed without hesitation that novels are for babies. Philosophy is for adults. On the evidence of this austere, barely realised mise-en-scène, it is difficult not to feel that Coetzee, like Plato, is no longer much interested in the accidents of our quotidian human world, the shadows on the cave wall. He is after essence alone, the pure, ungraspable fire. In his fidelity to ideas, to telling rather than showing, to instructing rather than seducing us, he does not actually write fiction any more. The Schooldays of Jesus, philosophically dense as it is, is parched, relentlessly adult fare – rather like eating endless bread and bean paste. What did you think of The Schooldays of Jesus?